I’ve been able to get back behind the wheel and drive again. Now I am able to get back some of my freedom, ability to see, and drive. The majority of what I do is computer and reading work. Dr. Shuldiner was able to give me many tools and techniques and the proper glasses to improve my capabilities of reading. When my macular degeneration began to interfere with my regular daily routine, I knew I needed help. Now, I have more confidence and see my daughter’s face so clearly. It has been a pleasure wearing the E-Scoops since obtaining them last Friday! It was wonderful being able to watch our granddaughter in her Junior Olympic Water Polo meets this past weekend. Thank you! Thanks so much for making me these glasses, I can’t wait to use them! Achieved: Reading, TV and faces with Full Diameter Telescopic glasses with reading cap. Oh my, they are so clear. Wow. I love them! Age: 53 Dx: Detached Retina, both eyes. Former Administrative Assistant now on disability. Desires to read street signs and newsprint. Prescribed Bioptic Spectacles for driving; Full diameter spectacles for reading. Goals: Driving; Reading; writing VA: 20/160 (passes California vision requirement). 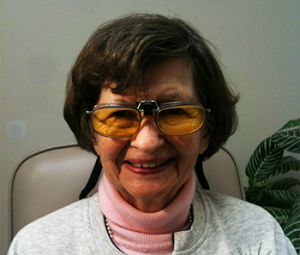 Achieved: Able to achieve better distance vision and sign reading with combination E-Scoop/Bioptic Telescopic glasses. Able to achieve reading and writing (for charting patient notes) with reading telescopes. Goals: play bridge, reading, TV. Vision very poor at 20/400. Achieved: Able to achieve TV with full diameter telescope spectacles. Able to achieve bridge cards with bifocal reading caps over the telescopes. Unable to achieve newsprint reading.